So much of the narrative around men’s sport is centred around the idea of a hero. The men who take the field each week to represent our favourite sporting teams are stereotypically known as tough, brave, physical, confident and are held up as heroes to the next generation of children aspiring to play their chosen sport. This bravery is always celebrated and idolised the most though when a player plays an important game while injured or being unwell. I reflect on the last couple of NRL Grand Finals – what’s remembered is how heroic Cooper Cronk was in his performance for the Sydney Roosters in 2018 playing with effectively one shoulder. Go back a couple more years when the South Sydney Rabbitohs won the Grand Final in 2014 and everyone remembers Sam Burgess playing with a fractured eye socket. Succeeding in the face of adversity is made even more heroic when athletes have to also physically defy the odds and these stories become part of a team’s narrative and sporting folklore. When it comes to women’s sport we are beginning to see heroes too – women who are celebrated because of their commitment, tenacity and dedication to the sports they love the most. Female athletes are also often recognised as role models because of how inspirational their stories are, how powerfully they speak off the field and how well they interact with young fans. But on the weekend in the WBBL Final between the Sydney Sixers and the Brisbane Heat a new hero emerged – Beth Mooney from the Brisbane Heat. In the wash up of the game, there has been plenty of focus on why it all went wrong for the Sixers, how positive it is to see the WBBL trophy leave Sydney for the first time since the competition’s inception and also plenty of praise for the crowd, with the match officially been declared a sell-out; but I want to focus on Beth and her performance, particularly given how ill she was leading into and during this game, compounded by the fact that she is a player that tends to struggle with the heat. The first thing to note is how hot and humid it was in Sydney last Saturday. The temperatures reached over 32 degrees in Drummoyne, but it was the humidity which made the heat oppressive. There was very little breeze and sitting in the hill in shorts was still stifling. With the Sixers winning the toss and electing to bat, Beth assumed her normal position as wicketkeeper in trying conditions, taking a couple of key catches throughout the innings, including a diving catch to remove Erin Burns for 12 and dismissing the very dangerous Ellyse Perry on 33. As wicketkeeper, not only is Beth crucial to the Heat’s innings in the field, but along with Grace Harris she also opens the batting. I found it truly incredible that after keeping in the sun Beth came out and almost lasted for the entirety of the Heat’s batting innings – she scored 65 off 46 balls and her 84-run stand with Kirby Short was crucial to the win, given that at one point, the Heat were sitting at 2-14 early in their chase. I remember sitting on the hill at Drummoyne and seeing Beth battle on throughout the innings. During breaks and in between overs she was visibly distressed and down on her haunches. Later I learned that at times during the innings Beth was calling for ice and for an inhaler and that there had even been discussions with doctors about her retiring. In the end, the decision was left to her and despite the challenges posed by the weather, Beth felt that she was still hitting the ball well, so continued on. After being caught by Ellyse Perry off the bowling of Dane van Niekerk, Beth immediately went to the sheds. She barely watched the last five overs because following her innings she had to immediately go into an ice bath. The only thing she saw was Laura Woolvardt and Josie Dooley return to the sheds, before she heard the shrieks of excitement when Laura Harris hit the winning runs – a boundary which sealed the win. For me, her performance will go down as one for the ages, particularly in women’s cricket and was the stuff that heroes are made of. Congratulations to Beth and the Brisbane Heat on an exceptional performance – the better team certainly won on the day. Given this is the first time the WBBL trophy has left Sydney it is also a very good indication that the quality of the competition continues to improve and that talent is well distributed across the country. 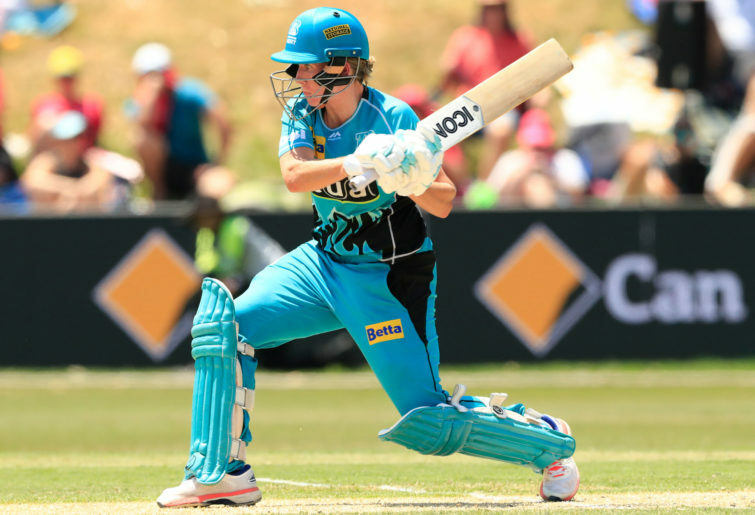 For any fans of women’s sport, don’t despair that the WBBL is over – there’s still plenty of cricket to come with the WNCL back this weekend and a couple of internationals left to complete the summer. Also, the Australian Women’s Rugby 7s team is in action today, tomorrow and Sunday in the Sydney leg of the World Series and the AFLW returns too with two new teams to admire.